fujisan_jp has no other items for sale. Highly recommended seller! The item arrived in a week. Thank you! Thank! Responsible seller, I recommend. I'm happy! Great transaction. Fast and efficient. This sunscreen is everything I've been searching for: decent price, non-irritating, great for everyday use, not sticky and no white cast! It has got a slight citrus scent, which fades quite fast, and the product absorbes quickly leaving a matte finish. You can't feel the sunscreen on my face after it has absorbed, so you can put your makeup on after a minute or so. If you are sensitive to alcohol in skin care products, this might not be for you, but for everyone else I'd recommend a try. HG! I have dry skin and I love this sunscreen. I apply it daily before makeup. The consistency is light, and it dries very quickly on your skin. Does not leave any white streaks. This sunscreen is NOT water resistant. This sunscreen will work best if you have normal or oily skin, I still use it with my dry skin. This contains Alcohol so if you do not like alcohol on your skin, do not purchase. This SS protects from UVB and UVA2 but not from UVA1 rays which means it's good for winter, not so good for the summer. Acabei de usar, então não tenho muito o que falar à respeito de proteção. Só o que eu já ouvi falar e por isso me motivou a fazer essa compra, de que o nível de proteção é um dos melhores do mundo! rs O produto é absorvido rápido pela pele e ela fica sequinha. Gostei muito! Só têm um detalhe, fui taxada. E o valor da taxa foi basicamente o valor do produto. Como um protetor solar no Brasil, com a mesma quantidade dá o mesmo preço, então é questão de escolha mesmo. Apesar da taxa, eu ainda prefiro investir nesse. 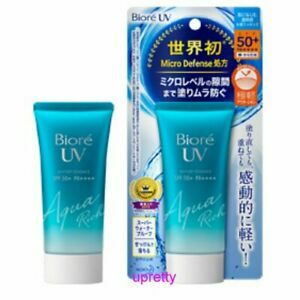 Biore Watery sunscreen is such a fabulous product, especially if you have oily combination skin. the SPF is 50 and does not make me 'break out' Make up sits so well on the top and it prevents shine all day. Definatley the best sunscreen i have ever tried!!!! When first apply there is a little bit smell, but as it absorbs to the skin the smell kind of fades away. There is no white cast, which is the best pro in this product. Plus, the seller are very nice and caring about the costumers.